The track record of 2030 WRG in stewarding Multi-Stakeholder Platforms (MSPs) from dialogue to action and impact is growing and has shown significant results in the 2018 fiscal year (July 1, 2017 to June 30, 2018) . A total of 746 partners (308 from the private sector, 154 from government, 284 from civil society/other) participating in MSPs in 14 countries/states, have created working relationships across stakeholders and helped to break down traditional silos to establish MSPs that survive changes in government. 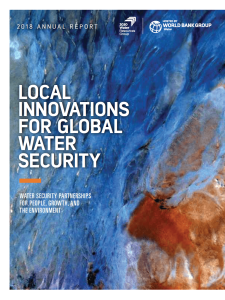 The year was mostly focused on the hosting transition from the IFC to the World Bank Water Global Practice. As part of this new arrangement, Kristalina Georgieva, CEO of the World Bank Group, appointed Laura Tuck, Vice President for Sustainable Development, as Co-Chair of the 2030 WRG Governing Council, to serve together with Paul Bulcke, Chairman of Nestlé. As 2030 WRG welcomed new Steering Board Members, the year offered the opportunity to revisit work program priorities as well as 2030 WRG communication efforts. This new and revised Annual Report aims to focus more on impact and innovation stories, showcasing collective action and partner contributions.